These shots are from Fukushima, a few hundred kilometres north of Tokyo. 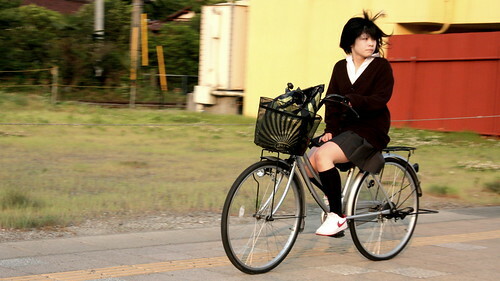 Even the youth of Japan got it all going on with the bicycles. What a great way to head home from school in the sunset. Cool cat, this one. And note the all important umbrella on the bicycle. Standard issue in any real bicycle culture. Give your girl a ride home. Well done him. Ok. so they have bikes there. Have they located the tire pump yet? classic gearhead comment... :-) most of us don't really give a toss. we just ride a bicycle. 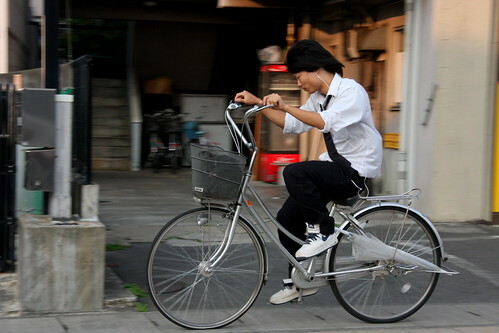 In Okinawa, school children are forbidden by law to ride the bike to school. 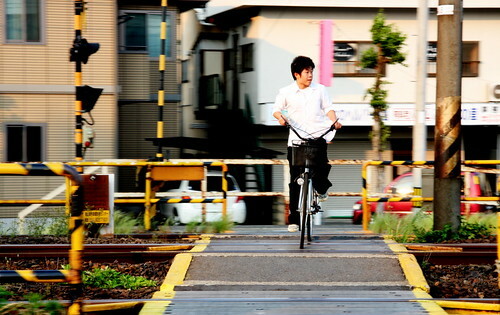 Out of curiosity today, I did a search for Tokyo/Japan/cyclechic. When I saw the text result, I thought it was somehow current or possibly right after the disaster. The area and whatever is recorded on these images and quite likely these people, have been wiped from the face of existance. It is quite ..haunting... Colored Ghost bikes.